Ahamad, son of Mousa Shaker Khorasani, can be considered as one of the pioneers in the science of mechanics in the post-Islamic Iran. His book "Alhial", which, as usual at his time, was written in Arabic (about 229 Iranian Calendar, 850 AD), is truly a scientific masterpiece. There are only four manuscripts of this book that survive: one copy is in the Vatican Library in Italy, two copies are to be found in Berlin and Gotha in Germany, and the last manuscript is in the Top Kapi Museum in Istanbul. He became very famous because of the mechanical devices he produced. Ibn Nadim wrote in his book Alfehrest: "The unique book Alhial describes several astounding tools that can be put into motion." Ibn Ghafti also refers to this book saying: "Alhial is a famous and marvelous book". "Ibn Kholkan says: "Alhial is an amazing book describing all sorts of automatic systems." Ibn Kholdoun writes: "There has remained a mysterious book in mechanics from Ahmad, the son of Mousa, which describes astonishing and surprising automatic mechanical devices." Judging by his book Alhial, we have to accept that he had a thorough knowledge of the rules and principles of mechanics especially of pneumatic and hydrostatic principles. 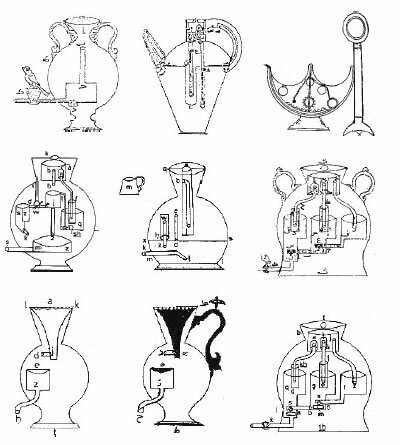 The instruments designed by Ahmad such as the automotive valves, timing devices, delay systems,… were unique not only in his time, but in the following centuries and indicate his talent and genius. What is of utmost importance is the use of the conical valves inside the gears of instruments for different usages and applications, especially, a crankshaft is seen in certain of his works and innovations 500 years before the invention of the crankshaft in Europe. Of course it must be noted that what Ahmad made in the 9th century could not be rotated completely, but it could be turned into a crankshaft with a little modification. Other sons of Mousa Shaker, besides Ahmad, are all recognized as the pioneers in technology and occupy special positions in the history of scientific innovation and achievements. According to indisputable evidence, most of these innovations and techniques entered into the mechanical engineering knowledge and the science of Europe centuries later, came from the East and in this regard the sons of Mousa Shaker Khorasani, especially Ahmad, played a significant role. The basic design of the conical valves which was invented by the Italian genus Leonardo da Vinci could be obtained from "Alhial". Of the most important works of these brothers, especially Ahmad, in mechanical engineering, are the tools which were installed by him inside equipment and which ran as a result of water and air pressure. Of these 103 models have been introduced in "Alhial" with full descriptions, each of which is considered as an engineering masterpiece of its times. Today the same principles as followed by Ahmad in his designs, are applied. Thus after almost 1200 years these instruments, have not scientifically lost their freshness and significance. A vessel with two valves, from each of which a different type of liquid pours out. A jug with one outlet, which, when pours sherbet in it, water comes out, and vise versa. A vessel with one valve through which water and sherbet would be poured in. When the valve opens, a specific amount of water comes out of it, then the same amount of sherbet and again water. A jar which has one valve with two types of liquid, but only the second liquid can come out. A vessel which acts as concentric flush tanks. More than 100 instruments were designed and made by Ahmad, and all of these are illustrated and described in detail in his book so that they can be reproduced by others.